The Mexica, otherwise known as the Aztecs (1), called the city Teotihuacán in their Nahautl language, roughly meaning the place where time began. Nestled in the Valley of Mexico, the Pre-Colombian city of Teotihuacan is one of the archaeological jewels of Mexico, where the pyramids of the Moon and the Sun dominate the 4 km long Avenue of the Dead as the main centre of attention for modern viewers of the city. Situated around this planned civic ceremonial complex were the residential barrios of the population, largely organised along ethnic lines, which consisted of open plazas surrounded by an inward looking residential compound (Goodman 1999). The 16th century AD rulers of Tenochtitlan, the powerful city-state at the centre of the Aztec Empire now located under modern-day Mexico City, regarded Teotihuacan as the foundation of Central American civilization (Evans 2008), although note that Mexico is considered to be a part of North America along with the United States of America and Canada. As Dr Jago Cooper of the British Museum recounts in the new BBC series Lost Kingdoms of Central America, the city of London itself would not pass the total population of Teotihuacan at its peak (around 100,000 people) until at least the 16th century AD. The Temple of the Sun at Teotihuacan, dominating the Avenue of the Dead. To the sides of the avenue the smaller ceremonial structures can be seen. Image credit: BBC. As grand as the remains of the city of Teotihuacan (100 BC to AD 650) are, it is the site itself that has withstood test of time, allowing archaeologists and researchers to excavate, plan and map one of the largest cities that the 1st millennium AD world had ever seen. Today Teotihuacan is a UNESCO world heritage site, chosen for its unique history, sheer magnificence and the incredible physical survival of planned city with a multi-ethnic population. During the city’s history there were around 2300 stone built apartment compounds that could house up to hundred to the dozens of people, although there have been suggestions that were ‘invisible houses’ constructed on the outskirts of the urban planned city consisting of un-walled house dwellings (Evans & Webster 2005: 615). There has been some suggestions that a portion of the early population came from the nearby basin city of Cuicuilco, which was destroyed by a volcanic eruption (Xitle) in the 1st century AD (Evans 2008). The monumental civic architecture is heavily associated with the religious rulers of the city, although no formal burial location of such a leader has been excavated or documented. The pyramids of the Moon (2nd largest, constructed around 200-450 AD) and the Sun (largest, constructed around 100 AD) are the largest buildings found at the city, and would have originally had constructed temples on their summits. The remains of adults and non-adults have been found around the perimeters and base corners of the pyramids, suggesting sacrifices (Evans 2008). Tantalizingly the documentary highlighted the ongoing archaeological excavation of a man-made cave under the 3rd century AD Feathered Serpent Temple building, as Dr Cooper interviewed the archaeologist Sergio Gomez on what could possibly contain the remains of one of Teotihuacan’s leaders. Excavations at the temple have also uncovered the remains of 260 individuals who had likely been sacrificed around 300 AD. Sugiyama (2005) suggests that the remains of individuals found at the temple probably highlights individuals who were taken from conquests outside of the city or represent individuals chosen from certain areas, the archaeological evidence shows that the individuals likely had bound hands and were carefully positioned into place and decorated heavily with artefacts of value. 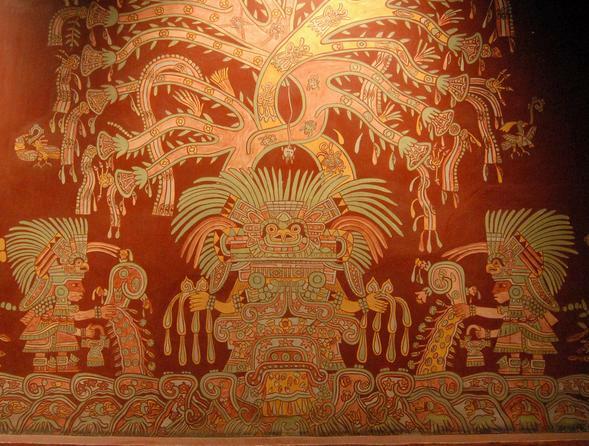 The beautiful mural art of the Great Mother Goddess of Teotihuacan, found at the Tepantitla complex and currently residing in the Anthropology museum in Mexico City. Image credit: Thomas Aleto via Flickr. Although home to numerous gods as was typical for the Pre-Colombian cultures in the Valley of Mexico, the Great Goddess of Teotihuacan is a god unique to the Teotihuacan population, appearing only where they have settled and appearing little after the downfall of the city around the 6th century AD. Surviving murals in the city suggest that the individual was valued only as a part of the population, and that the gods were venerated above this. As Evans (2008) discusses it was a rich theme in Pre-Colombian cultures that geography played an important part in understanding the cosmology and origin of the human population. Evidence of this has already been highlighted above with reference to man-made caves, but even the monumental architecture echoed the surrounding topography as evidenced by the outline of the pyramid of the Moon (Goodman 1999). As Dr Jago Cooper highlights in the program the belief system of binding people together through religion is not just found in the monumental architecture, but also through the mural artwork and the social roles of groups (not individuals) within Teotihuacan society. Sugiyama (2004: 99) remarks that the influence of Teotihuacan around the Basin of Mexico was notable with extensive trade links (obsidian, ceramics, foodstuffs, cotton, etc. ), and it has been proposed that at least some of the leaders of the Maya city states in the Yucatan region in the Atlantic bay of Mexico may have originated from Teotihuacan (Webster & Evans 2005). I was first introduced to Central American and Mexican archaeology during an undergraduate module focusing specifically on Pre-Colombian Archaeology, and it is always a subject that has remained vital to my understanding of archaeology as a dynamic subject. The civilizations of Central America remind me that although archaeological sites today appear dull and dirty (think of the marble and building work of the remains of Ancient Egypt, Greece, and Rome), more often than not they were once coloured and painted, that they were (arguably still are) integral as to how a population (or society) referred to both itself and as to how it wanted others to see it. The ceremonial stonework around the Feathered Serpent Temple at Teotihuacan seems that bit more visceral to me than the often firm and stately sculpture of Ancient Egypt, or say the perfect bronzed anatomy of the finely wrought representations of human flesh prevalent throughout the city states of Ancient Greece. Of course, one of my main interests is in prehistoric archaeology (alongside osteology), but that doesn’t mean that influence cannot be drawn from around the world and from different time periods. This is just a very short introduction to the city-state of Teotihuacan, but there are some further resources to have a look at below. I highly recommend watching the Lost Kingdoms of Central America series as the episodes are informative, interesting and present up-to-date research on the sites that the series focuses on, particularly the ongoing archaeological excavations at Teotihuacan. Archaeologists and anthropologists have uncovered and discovered a lot of information on the society, architecture, economy and religion of the Teotihuacan city-state that came to dominate the Basin of Mexico, yet there are many unanswered questions remaining, perhaps prominent of which are the identities of the rulers of the city themselves. (1). The Aztec term, in this sense, relates to the rise of the Aztec Empire during the Mexica Triple Alliance (Ēxcān Tlahtōlōyān) of the city states of Tenochtitlan (Mexica), Texcoco (Tepanec) and Tlacopan (Acolhua), who together ruled the valley of Mexico from 1428 until the Spanish Conquest of 1521. Of these three city states it was Tenochtitlan, with a population of over 200,000, which gained dominance as the capital of the Aztec Empire. The 4 episodes of the Lost Kingdoms of Central America series can currently be found on the BBC Iplayer site (UK only, although I’m sure they can be somehow viewed outside of the UK). The program is running in conjunction with the British Museum. On their website you can find out more information on the four cultures explored, including information on the Olmec, Chiriquí, Teotihuacan and the Taíno cultures of Central America. For any student studying for a degree or module in, or interested person intrigued by, the archaeology of Central America, I highly recommend getting your hands on a copy of Susan Toby Evans‘s 2008 publication Ancient Mexico and Central America: Archaeology and Culture History (third edition out in 2013). It is an in-depth and detailed book that highlights through clear text, diagrams and photographs the great wealth of the physical remains and cultural history of this part of the Americas. Learn more about the intriguing tunnel under the Feathered Serpent Temple and its excavation by archaeologists from the National Institute Anthropology and History here. I’ve blogged previously about some of the cultural destruction at Teotihuacan here. Evans, S.T. 2008. Ancient Mexico and Central America: Archaeology and Culture History. London: Thames and Hudson. Goodman, D. 1999. Cities of the New World. In: Chant, C. & Goodman, D. (eds.). Pre-industrial Cities & Technology. London: Routledge. pp.242-262. Sugiyama, S. 2004. Governance and polity at Classic Teotihuacan. In: Hendon, J. A. & Joyce, R. A. (eds.) Mesoamerican Archaeology: Theory and Practice. London: Blackwell Publishing. pp.97-123. Sugiyama, S. 2005. Human Sacrifice, Militarism, and Rulership: Materialization of State Ideology at the Feathered Serpent Pyramid, Teotihuacan. Cambridge: Cambridge University Press. Webster, D & Evans, T. 2005. Mesoamerican Civilisation. In: Scarre, C. (ed.) The Human Past. London: Thames & Hudson Ltd. pp.594-639. Hello Dr. Cooper. I enjoy the BBC’s documentaries about Mexico and the rest of America. I am Mexican, and we are often referred to as Central Americans and we’re not. Central America (as the Americans divided us) begins in Guatemala and ends in Panama. South America begins in Colombia and ends in Argentina. When I was a young student (many many decades ago) we were taught that Christopher Columbus had discovered America but we were never taught that he ‘only’ discovered Southern North America (Mexico) and South America. The Americans with the sole objective to withdraw from the rest of the continent, have given the rest of America weird names like Latin America, Central and South America and lately ‘the Americas’. Well, but my coment was about Mexico (sadly) not belonging to Central America but to North America, otherwise, why would Canada, the U.S. and Mexico would sign the NAFTA (North America Free Trade Agreement)? Wish you luck in the future. Sorry this isn’t Dr Cooper – I run the blog and just reviewed the program and report on some of the research. You are indeed quite correct – my mistake, however the program was titled the Lost Kingdoms of Central America so I shall leave it as it is, even though Mexico is North American. You’ll be glad to know that archaeology is discovering more and more of American archaeology, as a continent unto itself.